Hello! This is my first map, made more of as an experiment than anything else, please leave any and all critques below! Review by XpowersurgeX on 2/5/2015. The player starting in the North can reach this southern territory third round, which allows to block the South player's expansion. The South player could reach the northern territory Isla de la Juventud fourth round. In the preset scenario it is imbalanced in my opinion, but I think this map has a lot of fun potential in FFA with 4 or more players. Nice little map. The scenario is well-balanced. 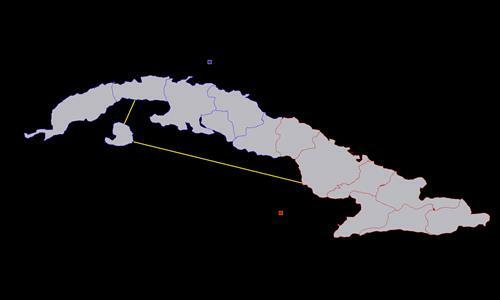 I've seen other Cuba maps connect Isla de la Juventud to Granma or Las Tunas, but I think Camaguey works nicely, as well. My strongest suggestion is to redraw your borders. They overlap a great deal and this makes the territories appear to change shapes. It's not a big issue on a map this small, but as your maps increase in size it can present a problem with connections and visibility.